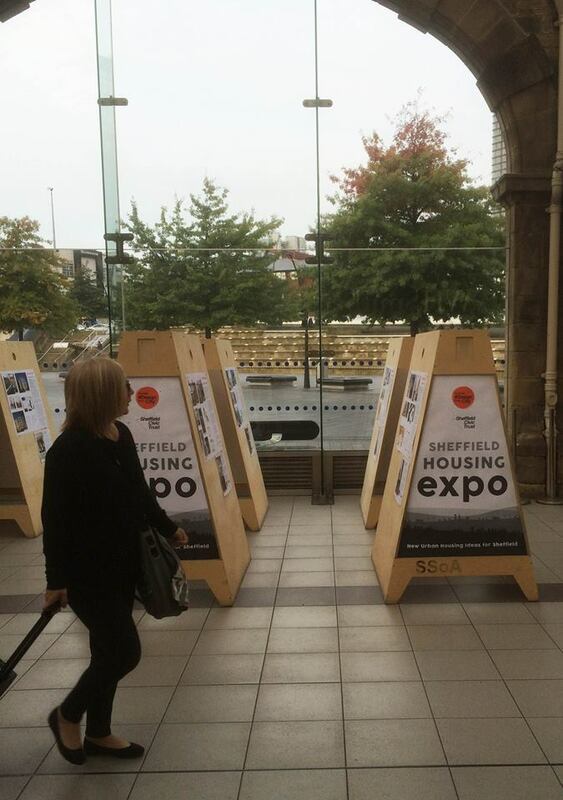 The Sheffield Housing Expo – an exhibition of innovative new housing design – has been launched at Sheffield Train Station as part of Sheffield Design Week 2016.Our exhibition called ‘New Urban Housing Ideas for Sheffield’ showcases 10 award-winning examples of urban housing from across the UK and Europe. They were selected and curated by Adam Park, Simon Chadwick and Tom Hunt, trustees of the Civic Trust, to show how new urban homes can be environmentally sustainable, affordable, and designed to the highest standard. They include a beautiful social housing block in Dublin, the first co-housing project in London, and the reimagining of a Sheffield terraced house. It presents photos and drawings of each project, key information about the designs, and explains why we have chosen them. 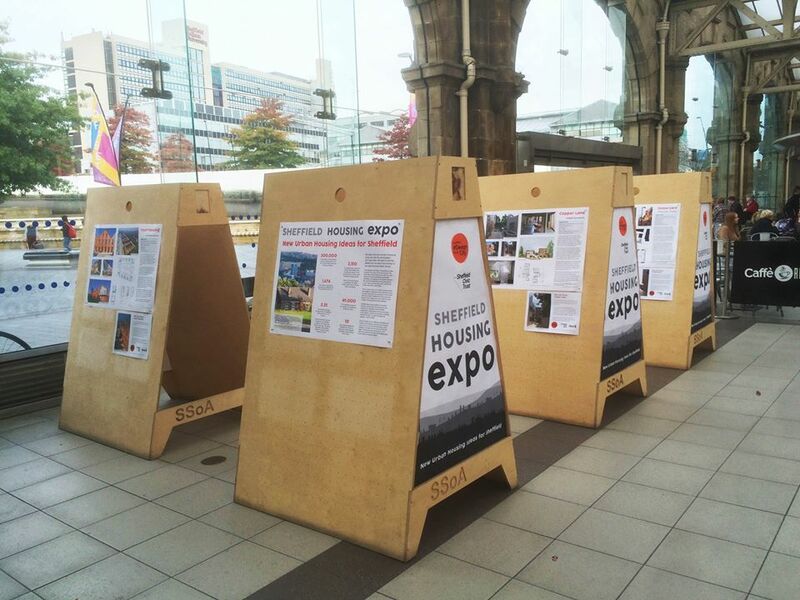 The Expo is on display at the train station, opposite Marks and Spencer, until Sunday 30th October. We need more new homes. Everyone knows this. But the conversation can’t stop there.We want to shift the debate from ‘we need more homes’ to ‘we need more and better homes‘. Our exhibition showcases 10 examples of urban housing from across the UK and Europe. They have been chosen because they show how new homes can be environmentally sustainable, affordable, and designed to the highest standard. But most importantly they provide great places to live. They show how new urban housing can create new urban communities. We’ve chosen urban housing because Sheffield has lots of sites, big and small, empty and in use, where we could imagine housing like these 10 examples being developed. New estates of semi-detached houses on green fields aren’t the only types of homes that can be built. Sheffield has a proud tradition of innovative housing and we want to be proud about new homes in our city again. Across Sheffield construction is taking place and cranes are back on the skyline – but let’s not just keep on building more of the same. It’s about increasing the quantity – and the quality. So this exhibition is our challenge to the Council, to the architects, planners and investors, and to all of us. Let’s be more demanding, more ambitious. Let’s learn from the best and then be better. The housing crisis can be solved. Let’s build more homes but let’s also put Sheffield back at the forefront of housing design. The architects involved in the exhibition include Project Orange, Ash Sakula, Niall McLaughlin Architects, Pitman Tozer Architects, Claire and David Kemp, Henley Halebrown Rorrison, Architecten-en-en, and O’Donnell and Tuomey, and Peter Barber Architects. The exhibition was designed and produced by Sheffield Civic Trust in collaboration with The University of Sheffield School of Architecture. The expo at the station is great but why’ve you not got it on this website (or if you have easier to find)? I had a quick look at the station and thought I’d continue to look online, but no joy.